ADDIS ABABA – An international rights group is urging Ethiopia’s government to end “repressive tactics” against Muslim demonstrations. At a protest in Ethiopia’s capital on Thursday marking the Muslim celebration of Eid al-Fitr, Muslims chanted slogans asking the government to respect their rights. Witnesses told an Associated Press reporter that hundreds of protesters were beaten by police who dispersed the crowd near a stadium where mass prayer was being held. Police blocked roads leading to the stadium. Amnesty International said it’s concerned with authorities’ crackdowns on freedom of speech and the right to assemble. The group said Ethiopia should restrain its response and avoid future bloodshed. 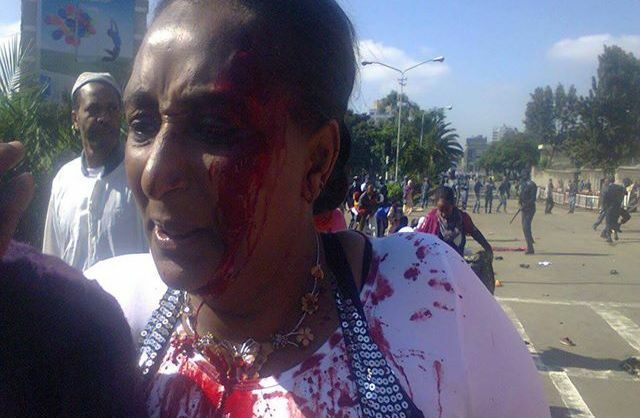 ADDIS ABABA – Muslim protesters in Ethiopia’s capital Addis Ababa clashed with police, resulting in several injuries during Idd el-Fitr prayers on Thursday. Members of the Muslim community have been demanding that the authorities respect their right of electing their own religious leaders; they have also demanded the release those arrested over the same. There have been tensions in the past several months, especially during Friday prayers as the worshippers engage the police in running battles during demonstrations. Last week government media reported a clash between the police and “messengers of terrorists” in Arsi Kofele town of Oromia region. Following today’s clashes, Amnesty International released a statement calling on the Ethiopian government to end “its use of repressive tactics” against demonstrators. Read more at Africa Review. 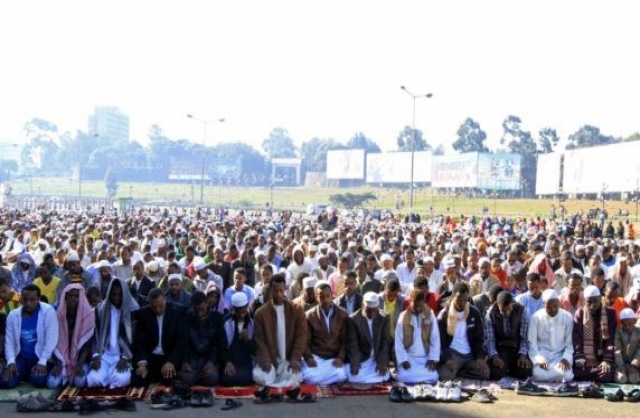 ADDIS ABABA — Muslims in Ethiopia protested in the capital Addis Ababa during Eid al-Fitr prayers on Thursday, part of a two-year-old campaign against what they say is government interference in their religious affairs. A heavy police presence around the city’s stadium — the venue for morning prayers — marked a tense run-up to the Muslim holiday after clashes between Muslims and police killed up to five people last week in Ethiopia’s south. Demonstrators chanted “Allahu Akbar” and hoisted banners that read “respect the constitution,” referring to allegations that the government has tried to influence the highest Muslim affairs body, the Ethiopia Islamic Affairs Supreme Council. Ethiopia, long seen by the West as a bulwark against militant Islam in the Horn of Africa, denies the claims but says it fears militancy is taking root in the country. “These were Salafist elements who tried to create disturbances as the crowd went back to their homes,” government spokesman Shimeles Kemal told Reuters, referring to the ultraconservative brand of Islam followed by al Qaeda. Muslims make up about a third of the population in the majority Christian nation of 85 million, and the vast majority follow the moderate, Sufi version of Islam. Some have been staging mosque sit-ins and street protests in the capital for almost two years. They accuse the government of promoting an “alien” branch of Islam — the Al Ahbash sect — which is avowedly apolitical. The government denies that, and protesters’ allegations that authorities tried to rig elections to the Islamic council earlier this year. Shimeles said the protesters aimed to set up an Islamic state in the country and were bankrolled and guided by “extremists” overseas. Thursday’s incidents followed clashes in Kofele in Ethiopia’s Oromiya region, where government officials said Muslims wielding machetes and arms clashed with police, killing police officers and civilians. The protesters blamed the authorities for the incident. Amnesty International urged Ethiopia on Thursday to end “its use of repressive tactics” against the demonstrators.